In his series on making Memorial Day more meaningful, Steve McCallion presents solutions from quieting our social networks in observance to asking companies to celebrate country over commerce. 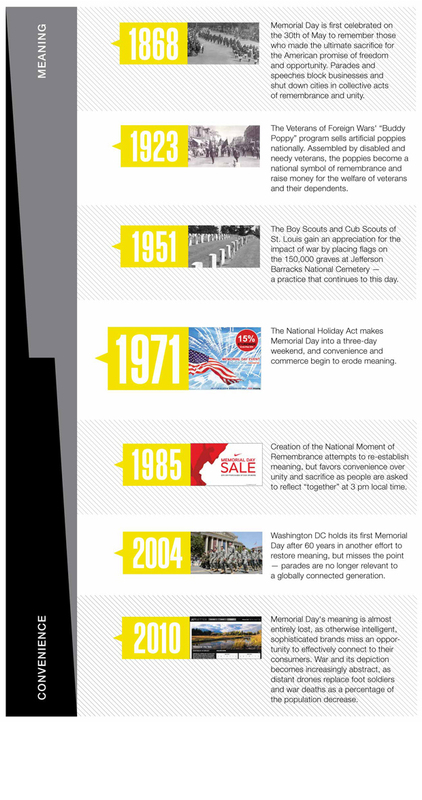 So far we’ve explored how Memorial Day lost its meaning, but how can we get it back? How can we remember Memorial Day in a way that is authentic and relevant today? In this era of instant gratification, can we come together as a nation to recognize the sacrifices that have been made for our freedoms? While we don’t have all the answers, and we understand the issues are complex, we do have an opportunity to initiate a conversation about what can be done. To do this we’ve outlined a few ideas below. The goal is not to propose the answer, but to stimulate thinking about how Memorial Day could be more meaningful, and re-connect people to Brand America. Meaningful ideas will be based on principles identified in my previous post: they have to be a bit inconvenient (sacrifice), something we can all do together (unity), and something that meets people where they are today (relevant)–no parades, in other words. We recognize that a lot of people are doing very thoughtful things for Memorial Day and that some of these efforts just need to be aggregated and amplified. Some of our suggestions are intentionally very small, but through collective involvement could become very meaningful. We hope this is the beginning of a fruitful conversation and look forward to hearing your ideas. Sometimes the best thing to do is nothing. Is it possible that we could come together as a country to do nothing? The “moment of remembrance” created by Congress in 2000 was a step in the right direction, but it was too convenient and didn’t meet people where they are. Today is all about social media, TV, radio…24/7, always on. Can we turn off for Memorial Day? What if we called for a Social Media Moment of Silence? Given the central role electronic communication plays in the lives of Americans, especially American youth, abstaining from it for even a moment constitutes a very real sacrifice. 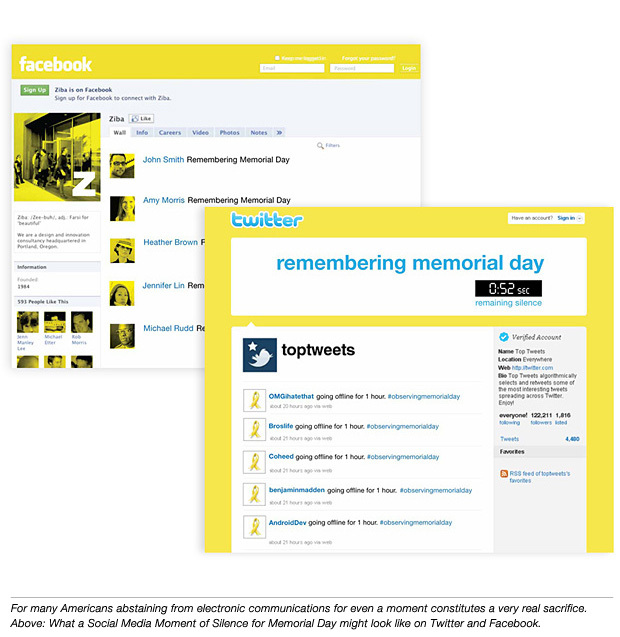 At 6:00pm EST (18:00, when “Taps” is played at the end of the military day) we could have Americans across all time zones make a final tweet or status update, reading simply “Remembering Memorial Day,” perhaps accompanied by a yellow-hued avatar to drive the point home. Those with a specific person to memorialize would follow the word “Remembering” with the name of their fallen friend or relative. Twitter and Facebook users could leave this statement just before going silent, so their friends’ screens are filled with multiple iterations of this simple message. Web traffic monitoring sites could follow up with a graph visually depicting the drop in traffic to document the power of this collective action. Maybe we could start small, asking for a mere 10 seconds of silence. Each year we could add 10 seconds. Gradually increasing the time each year brings us to a full minute in 2015: a shared national journey toward relearning the concept of sacrifice. While attempts have been made on the Web to memorialize fallen soldiers on the Web, these sites remain primarily the domain of servicepeople and their families, missing an opportunity to bring everyone together. In the past, main street parades were an effective way to engage the general public; today YouTube and other social media sites are the new main streets of America. What if YouTube became our new parade? Rather than have kids completing Memorial Day crossword puzzles in homeroom, we could have them interview someone who has lost a friend or family member in war. Like StoryCorps, we could build a national tapestry of stories about those who have died for our freedom. Kids could post them at youtube.com/memorialwall, and during the day teachers could have students listen to these stories. 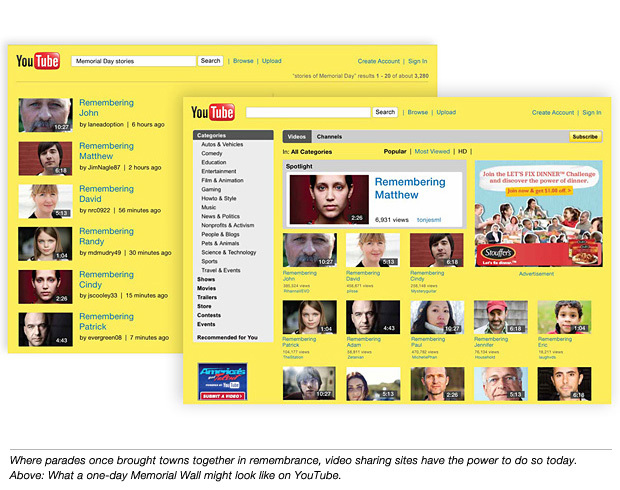 By midday, perhaps, most popular, most viewed and newest videos could all be Memorial Day stories. The ideas above focus on individual sacrifice and unity, but what about the corporations that profit from the convenience and commerce stimulated by the three-day weekend? These companies benefit twice, first from the values defended by thousands of fallen soldiers, and second, from the three-day weekend that stimulates commerce. 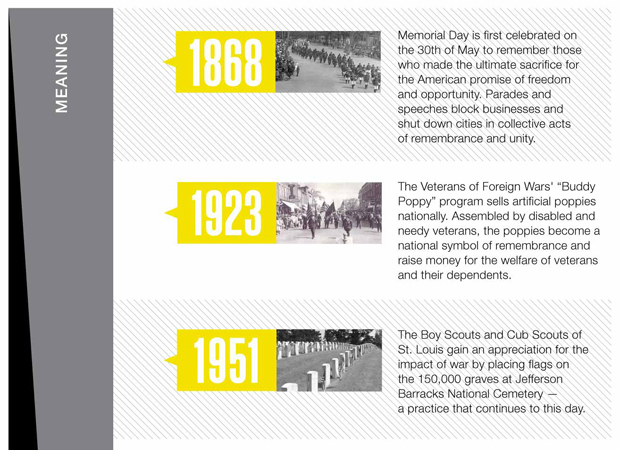 How about asking American companies to recognize Memorial Day in a collectively meaningful way? Some currently recognize the day separately, but how can we create a sense of scale and enormity equal to the memory? Maybe corporations could do something they wouldn’t ordinarily do–sacrifice something that’s meaningful to them. Google, for instance, has strict adherence to the simplicity of its home page. Adding something to this page is like initiating an Act of Congress. What if, in addition to the yellow ribbon they featured last year, they included a revolving name of a soldier who has died. It could include who that person was (son, father, brother, sister, uncle, etc.) in addition to being a soldier. Throughout the day, based on the number of times people use Google, we could remember everyone who has died for the American promise. 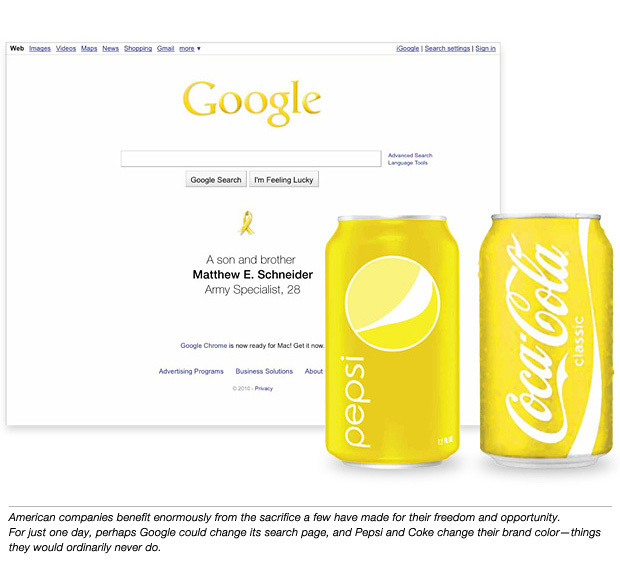 Alternatively, respected brands could give up something that they cling to religiously–their corporate color. 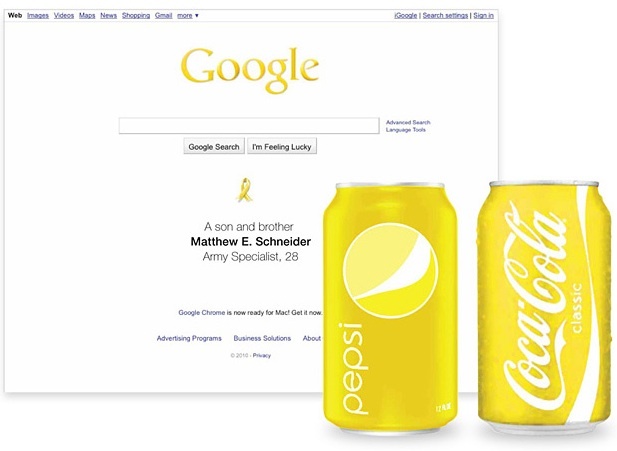 What if we could get all the leading American brands to change their corporate color to yellow for one day? They could eventually offer yellow products (like the [RED] campaign) and donate proceeds of all yellow sales to the Fallen Heroes Fund. Coke and Pepsi, Home Depot and Lowe’s (maybe even Fast Company? )–the unified expression would be powerful and memorable. In the end, each of these ideas is just one small step, but restoring the meaning of Memorial Day is part of a larger opportunity: the way people experience America, both domestically and abroad, is out of sync with its promise. Just ask the chairman of the Joint Chiefs of Staff, Admiral Mike Mullen, featured on the cover of this month’s Fast Company, who’s trying to reconnect our military identity with America’s promise of freedom and opportunity. As with any brand, this gap will make it increasingly difficult to compete in the future. It’s crucial that we make reconnecting promise and experience a priority to protect the brand we love dearly. created a timeline of the holiday in our culture. Click the image to launch the full-size version. Decker, Whirlpool, FedEx, McDonald’s, Coleman, Kenwood, and Compaq.